We’ve done a lot of PCBs with the toner transfer method over the years. The idea is simple: print a pattern using toner (which is just ground up black plastic) and then use an iron or other heat and pressure device to transfer the toner to a copper-clad board. It works and it works well. But getting just the right combination of heat, pressure, release paper, and toner is sometimes tricky. Some people hack their printers to turn off the fuser wire (to make the toner not stick to the paper) or to run a PCB directly through it. If you have a big expensive laser printer, though, you might not want to chop it up just to run PCBs. Have you looked at laser printer prices lately? We aren’t sure if it is cheap units flooding the market, or the overwhelming popularity of color printers, but you can pick up a Pantum P2500 for about $25 or $30–and probably get WiFi printing at that price. [Mlermen] picked one of these up and shows you how to convert it to a PCB printer. It seems hard to imagine, but in the early part of the 20th century, there weren’t a lot of great options for creating copies of documents. The most common method was to use carbon paper to create multiple copies at once from a typewriter or a line printer. All that changed with a company called Haloid. Never heard of them? They later became the Xerox company. The underlying technology dates back to 1938 (invented by a physicist who was also a lawyer). In 1944, they produced a practical copier and shortly thereafter sold the rights to Haloid. The Haloid company originally made photographic copy machines that used wet chemistry. 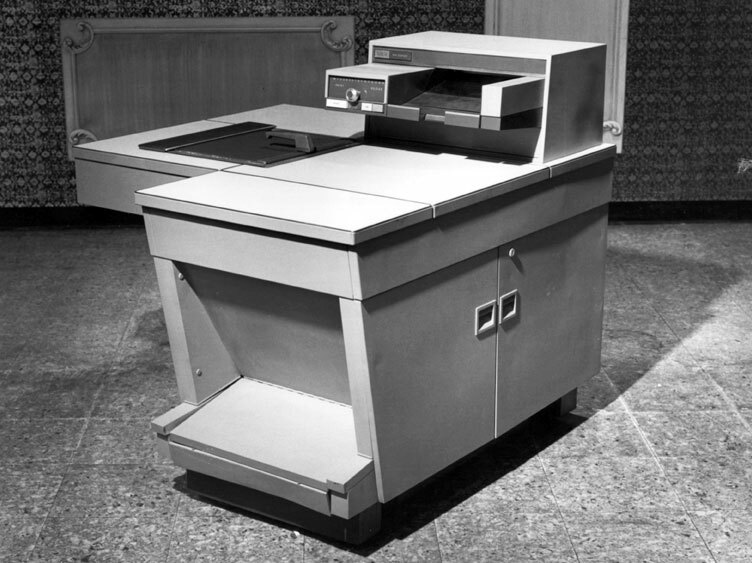 In 1959, the Xerox 914 (so called because it could copy a 9″ x 14″ document) came on the scene (that’s it, below). The 650 pound copier could make seven copies per minute and came with a fire extinguisher because it had a tendency to burst into flames. If you didn’t want to spend the $27,500 price tag, you could rent for only $25/month (keep in mind that in 1959, $25 would buy about 25 pounds of T-bone steaks). You can see a commercial for the 914 in the video below. In the commercial, you’ll see them make a big deal out of the fact that the print was dry. That’s because a lot of previous machines used actual photographic processes with wet chemistry. Obviously, that also took special paper. If the copier didn’t exist until recently, how did people make copies before? Turns out there were lots of ways to make copies of varying degrees of bad quality or extreme trouble. In some sense, the best copies were made by scribes just writing down a second copy of things. There were a variety of machines that would capture what you wrote and make a copy by mechanical or other means. A polygraph (not the lie detecting kind) allowed Thomas Jefferson to write letters and make a copy. The machine moved a pen to match the movements of the author’s pen, thus making a near perfect copy. With a few adjustments, this became the pantograph which not only does the same job, but also can shrink or enlarge the copy. Carbon paper was widely used to make multiple copies of handwritten and typewritten documents. Members of the Rabbit Hole hackerspace spent the last weekend competing in The Deconstruction, a 48 hour hackathon competition. The hackerspace’s theme was “Light it up!”, so members created some awesome projects involving light. The star of the show was their bacon cooking machine. The Rabbit hole made the “Push Button. Receive Bacon” meme real. A broken laser printer was gutted for its drive train and fuser assembly. Laser printer fusers are essentially hot rollers. The rollers melt toner and fuse it with paper as it passes through the printer. The heat in this case comes from a lamp inside the roller. That lamp also puts out plenty of light, which fit perfectly with the team’s theme. The Rabbit Hole members wasn’t done though, they also built a pocket-sized infinity mirror from an empty Altoids tin. The bottom of the tin was cut out, and a mirror glued in. A filter from a broken projector made a perfect half silver mirror, and some LEDs completed the project. The members also built a fandom art piece, consisting of 25 fans connected together in a skull shape. The eye and nose fans were lighted. When the fans were plugged in, they kicked for a few seconds before spinning up. Once they did spin though – there was a mighty wind in the Rabbit Hole. Click past the break for The Rabbit Hole’s Deconstruction video! Precisely applied ultraviolet light is an amazing thing. You can expose PCBs, print 3D objects, and even make a laser light show. Over on the Projects site, [Mario] is building a machine that does all of these things. 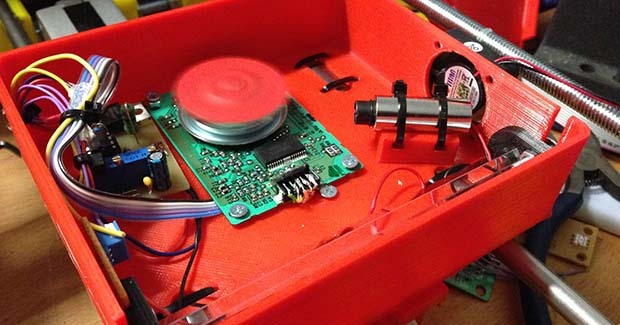 It’s called the OpenExposer, and even if it doesn’t win the Hackaday Prize, it’s a great example of how far you can go with some salvaged electronics and a 3D printer. The basic plan of the OpenExposer is a 3D printer with a small slit cut into the bed, and a build platform that moves in the Z axis. The bed contains a small UV laser and a polygon mirror ripped from a dead tree laser printer. By moving the bed in the Y direction, [Mario] shoot his laser anywhere on an XY plane. Put a tank filled with UV curing resin on the bed, and he has an SLA printer. Put a mounting bracket on the bed, and double-sided PCBs are a cinch. The frame is made of 3D printed parts and standard RepRap rods, with the only hard to source component being the polygonal mirror. These can be sourced from scrounged laser printers, but there’s probably some company in China that will sell them bulk. The age of cheap SLA printers is dawning, friends. Video below, github here. Making a few PCBs with the toner transfer method is a well-known technique in the hacker and maker circles. Double-sided PCBs are a little rarer, but still use the same process as their single-sided cousins. [Necromancer] is taking things up a notch and doing something we’ve never seen before – double-sided PCBs made at home, with color silkscreens, all make with a laser printer. For laying down an etch mask, [Necro] is using a Samsung ML-2167 laser printer and the usual toner transfer process; print out the board art and laminate it to some copper board. The soldermasks use a similar process that’s head-slappingly similar and produces great results: once the board is etched, he prints out the solder mask layer of his board, laminates it, and peels off the paper. It’s so simple the only thing we’re left wondering is why no one thought of it before. Apart from the potential alignment issues for multiple layers, the only thing missing from this fabrication technique is the ability to do plated through holes. Still, with a laser printer, a laminator, and a little bit of ferric or copper chloride you too can make some very nice boards at home. The migraine-inducing image above is the product of [Rupert Hirst]’s attempts at home PCB fabrication. He’s using the toner transfer method – printing a circuit on a piece of transparency sheet with a laser printer, setting it on a piece of copper clad board, and sending the whole assembly through a laminator. It’s a fairly straightforward process, but if you can’t run a transparency sheet through a printer multiple times your etch resist won’t hold up too well. Of course the transparency sheet must be aligned each time it goes through the printer, so [Rupert] came up with a modification that ensures laser toner goes only where it’s supposed to. [Rupert] picked up a Samsung ML-2165W laser printer for his PCB fab shop, but printing the same image multiple times on the same transparency sheet would result in unusable masks. This problem was fixed with a few plastic shims used to hang door frames and a card stock tray that ensures the transparency sheet goes through the printer the same way every time. We saw [Rupert]’s homebrew PCB fabrication process a few weeks ago when he sent in his six channel floppy drive MIDI synth. In his build video, [Rupert] demonstrated what is possibly the cleanest toner transfer PCB we’ve seen to date. You can check out his etching process in the video after the break.